The 5th meeting of the NSSS M&E Committee was held on the 10th of April (Wednesday), 2019 at 2.00 PM at GED Conference Room, Planning Commission Premises, Sher-e-Bangla Nagar, Dhaka, under the auspices of the “Social Security Policy Support (SSPS)” Programme being jointly implemented by the Cabinet Division and GED. 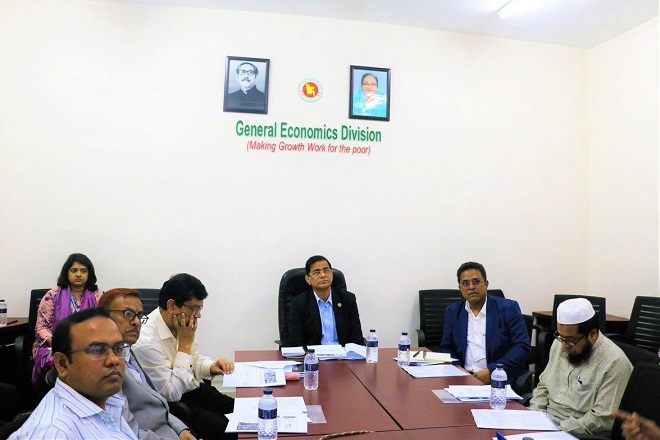 The meeting was chaired by Dr Shamsul Alam, Member (Senior Secretary), GED and Chairperson of the M&E Committee. Participants of the meeting included other members of the M&E Committee. Mr. Md. Faizul Islam, National Project Director, SSPS Programme; Mr. Aminul Arifeen, National Project Manager, SSPS Programme and other officials from SSPS Programme attended the meeting.